hen the last son of the founder George S Parker, Kenneth, died in 1979 the company stood for maybe as much as 50% of all the exports of writing instruments made from the United States. This was achieved through a chain of foreign subsidiaries spear-headed by Parker in the UK. As much as 80% of Parker's total sales came from more than 150 foreign countries. Since the dollar at this time was weak Parker in the US made a lot of money on the exchange. But by the early 1980's Parker's manufacturing facilities were old, worn and inefficient, a fact that Kenneths nephew George Parker II, who had taken over as President in 1966, didn't rectify. Furthermore there was no real long time plan for the production which lead to a confused marketing department who often had no idea what models or types they were supposed to be selling from month to month. Including writing equipment produced abroad Parker was now offering alomost 500 different writing instruments. Parker was so decentralised that the smaller subsidiaries had the mandate to make crucial business decisions and more than 40 advertising agencies were advertising Parker pens all over the world. As time would show, the different advertising was in fact a good strategy, since the agencies knew their local markets, but the downside was that Janesville didn't even know which, or how many Parker pens were made and sold. n 1982 Parker's net income was down with 60% and the market share was down to 6%, according to Financial Times. Within a few years Parker had gone from being one of the most successful pen companies in the world to a highly decentralised company with a internal situation that was quickly deteriorating. The company structure and operations in the US proved very costly and the company was also taking a hit from a world recession and the subsequent strength of the US dollar. Something had to be done. In early 1982 George Parker decided to bring in a new management team from outside the company. This was previously unheard of. Parker had always been a family company. Parker offered James Peterson, an executive vice-president at R.J.Reynolds, the job as Parker's new president and CEO, and Manville Smith was recruited as president of the writing-instrument group. Smith was born in Quito, Ecuador, and grew up and got his Masters of Economic in Lima, Peru. He came from 3M, and obviously had a broad international background. Only 30 years old he had been appointed division president at 3M. Richard Swart became the new vice-president for marketing of the writing instrument group. He came from the advertising agency BBDO long experienced with marketing planning. ack Marks became the head of writing-instrument advertising, he was convinced to leave Gillette where he had worked with the global marketing of Paper Mate pens. The fifth member of the new team was Carlos Del Nero, manager of global marketing planning, who left Fisher-Price for Parker, according to Ilkka A Ronkainen in his book International Marketing. The five men were highly skilled in international business and was very experienced. They all left high-paying positions to come work for Parker for the specific purpose of saving the company. James Peterson's business vision was to transform Parker to a highly centralised company. A company with one strategy, one marketing plan and one small group of leaders. Peterson started to dismantle Parker's diversified world-wide organization. He slashed the product line from 500 to the 100 most profitable items, according to New York Times. This also meant that Janesville headquarters was going to decide which models should be produced abroad and not. Peterson also ended the cooperation with 40 local advertising agencies in favour of Ogilvy & Mather, the "world-class agency". he trouble was that when highly successful agencies like Lowe Howard-Spink in London were fired, this was devastating for both the business and the morale at Parker in Newhaven, UK, the company's most profitable subsidiary. Newhaven had in fact been bringing home the bacon for Janesville for years. And now Janesville was telling Newhaven how to run their business leaving Newhave out of the decision loop. When Manville Smith arrived as president of the writing-instruments group, he evaluated Parker internationally and he was shocked to see that Parker only had a six percent share of the global pen market, and didn't take part at all in the segment that was responsible for 65 percent of the world-wide pen sales, pens that sold for less than $3, according to Ronkainen. This was the very area George Parker II had decided to leave in the late 1960's when he shut down Parker-Eversharp. Smith decided against George Parkers wish that it was essential to participate in the lower end of the market in order to survive. He realised that Parker UK already had developed a pen that would fit the strategy, the RB1, later known as the Vector. He decided that the Janesville factory was in immediate need of an upgrade, and $15 million were invested in a new hyper-modern factory which main objective was to manufacture the Vector roller-ball, that would sell for $2.98. Smith calculated that the Vector could be produced for 27 cents which would of course result in huge profits. alcolm Troak tells us in his book "Pen to paper" how Smith decided to close the Janesville's Arrow Park factory from May to November 1983 for the remodeling. This meant that Newhaven had to supply the world demand for six months. Incredibly enough Newhaven rose to the challenge and sometimes produced more than a million pens pen week! Peterson had given Manville Smith six months to get the Arrow Park running again, but it was soon clear that it would not be finished for the Christmas season of 1983. The new factory was to be computer-automated but it broke down repeatedly and Parker eventually had to hire manual labour again to fulfill the Christmas demands, which cost Parker millions of dollars. 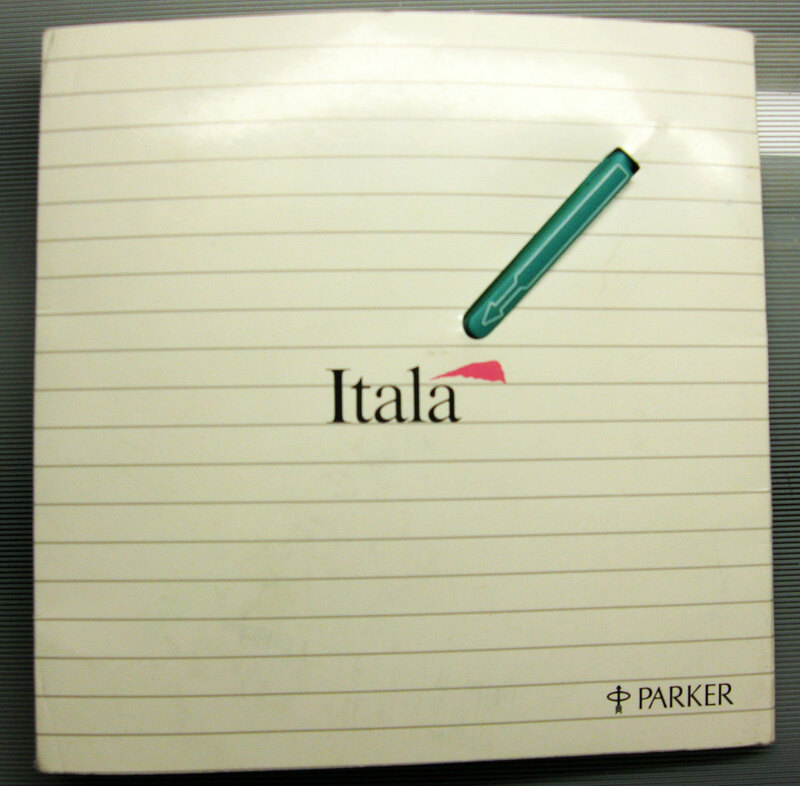 After the Vector, Manville Smith had planned goto even deeper into the low-price market with the Itala, which would be Parker's first disposable pen. 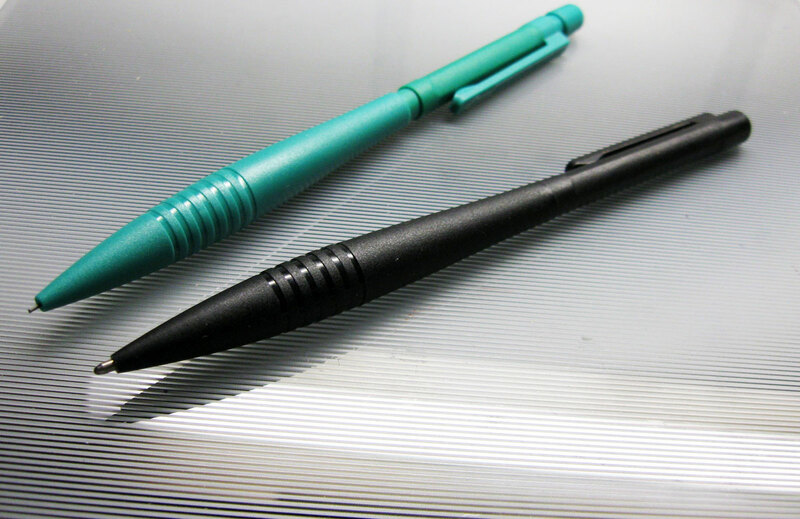 It was a matte black all plastic pen which was twist action actuated. It was designed by the Italian designer Giorgetto Giugiaro, who among other things also designed coffee machines and cars for Maserati. he Itala looked like an oversized throwing dart, gripping rings and all. Possibly a hint that you could throw it away when you were finished with it. In fact you had to, since the pen contained a non-removable cartridge, and not the standard Parker refill. The clip was square with an outline of the Parker arrow in white or (rare) blue. A matching mechanical pencil was also made. Green prototypes have also been found. The Itala was test-marketed in Europe but never made it into regular production, because George Parker reacted fiercely against the idea. He was allegedly furious that Manville Smith went against his expressed wishes in developing the pen. 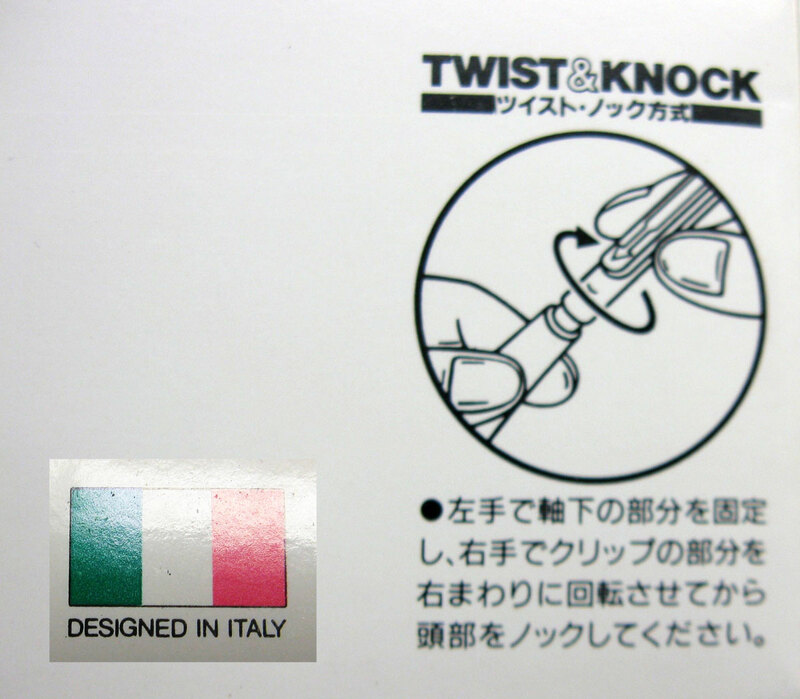 The Itala was manufactured in Japan and was offered in a hard cover envelope. 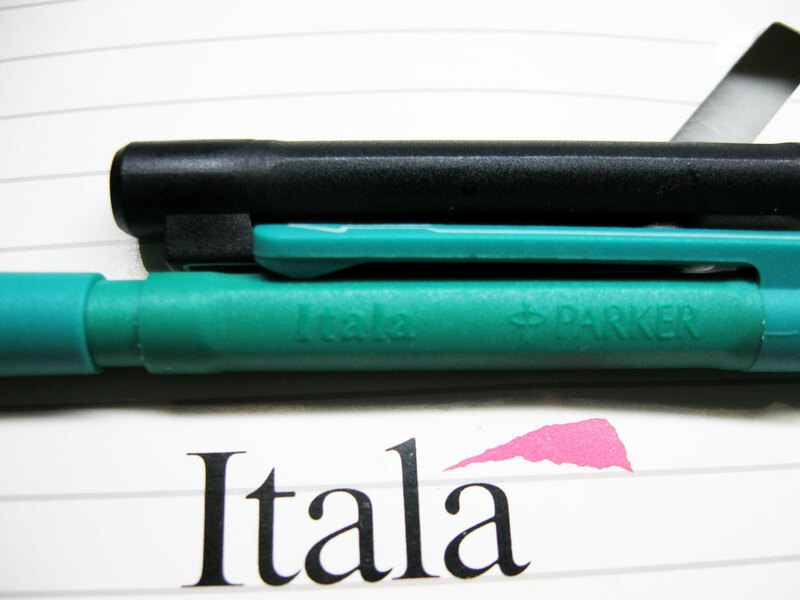 The patent application was filed in December 1983 by Parker in the Netherlands, but when the patent finally was accepted in September 1985, the Itala had already been put on the shelf. George Parker was in fact so enraged about the idea of diminishing the Parker trade mark by offering a throw-away pen that he had Manville Smith fired. And since the failed Janesville-Vector time-line was Smith's pet project, George Parker was provided with a good reason for letting him go, according to Smith himself. ames Peterson was still convinced that only an intense global marketing strategy could save the company. He decided that Parker in March 1984 would get into "in every viable segment of writing-instrument business". He also let there be known that "the concept of marketing by centralized direction has been discussed and consensus reached". He was going to centralise Parker, and now. Firing Manville Smith turned out to be catastrophic. He was the only one in the team who saw the need for local advertising flexibility. Smith had been involved with Ogilvy & Mather on the first global advertising campaign, and thanks to him Ogilvy & Mather had in fact allowed for some local flexibility. When Smith left no-one opposed Peterson's "one-look" advertising. The results would prove calamitous. Also the way Peterson enforced his advertising policy alienated the remaining managers who previously had supported him. His proclamation read: "Advertising for Parker pens [no matter model or mode] will be based on a common creative strategy and positioning. The worldwide advertising theme, 'make your mark with a Parker', has been adopted. [It] will utilize similar graphic layout and photography. It will utilize an agreed-upon typeface. It will utilize the approved Parker logo/graphic design. It will be adapted from centrally supplied materials", according to Ronkkanen. anagers abroad were sent materials and told to get on with it. They were treated as implementers of a strategy that had nothing to do with their own knowledge of their respective markets. Many of them immediately realised that the new campaign was stillborn in their home markets. The fact was that it didn't work anywhere. Jack Marks, in charge of writing-instruments advertising, later confessed that the campaign "tried to say something to everybody and didn't say anything to anybody". In spite of all this Peterson himself refused to admit that the strategy wouldn't work. In January of 1985 he once again tried implementing his global advertising, to no avail. Peterson's position was now terminal. There was a wide sense of resentment towards how Parker was run and of the management, and following "very stringent cuts" in all areas, morale was low, production problematic, and the reaction against the campaign was so fierce that Peterson resigned the day before New Years Eve in 1985 after a meeting of the company's board in Marco Island, Florida. Parker had acquired Manpower in March 1976 and by this time it was clear that Manpower had surpassed Parker itself in earnings. When Peterson was gone Mitchell Fromstein, the president of Manpower, stepped into his shoes. The unbelievable decision was made that Parker would pull out from the pen business. Fromstein was himself against Peterson's marketing startegy. He gathered the company's managers in Janesville and told them that "global marketing is dead. You're free again". nfortunately Parker pens in Janesville would never recover financially. During the 1980's it was Parker's subsidiary in Newhaven, UK who continued to flourish. The RB-1/Vector, developed in the UK, became one of Parker's most selling models and is still around today. Other successful designs like the The Parker 25, the Sonnet, Frontier, Insignia, Parker 100 and the Centennial Duofold all came from Newhaven. Eventually Parker Newhaven succeeded in a buyout of the Writing Instruments Division in February 1986 and corporate headquarters moved to Newhaven, England. espite a world recession, Parker increased its turnover by almost 50% in the five years following the management buyout. James Peterson went on to work for The Dun & Bradstreet Corporation, while Manville Smith worked at Right Management Consultants for 12 years before moving to Spherion. Even today the Parker-Peterson experiment is used in marketing schools as a case-study of the importance of knowing your local market.